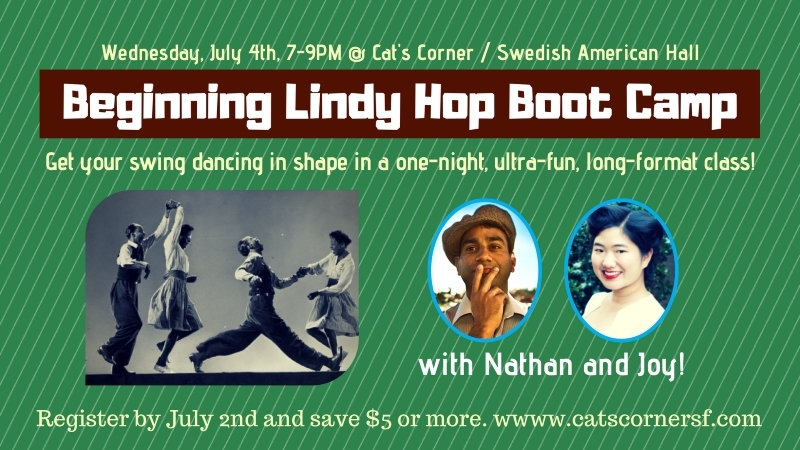 Learn to swing dance and Lindy Hop at Cat’s Corner! Have fun, meet new people, and get great exercise all at once! Cat’s Corner is OPEN on July 4th, 2018 with a special evening of workshop style, single night only classes…followed by our usual 30-minute drop-in class and live music dance party! Our usual monthly session of classes resumes the following Wednesday, July 11th. This short and sweet class is designed for the absolute beginner with no previous dance experience. We start from scratch each week, covering partner dance fundamentals and introducing simple 6-count East Coast Swing, Jig Walks and Charleston steps to get you out on the dance floor and grooving to the music. Cost: $10 per week (includes dance party admission). No registration required. Lindy Hop is one of the oldest swing era dances, from which many other swing dances evolved (including East Coast Swing, West Coast Swing, Boogie Woogie, Rock’n’Roll and Jive). It melds structured partner dancing with the improvisational freedom of vernacular jazz dancing…and it’s super fun! Whip your swing dancing into shape in an ultra-fun, briskly paced, extra long class format that will get you up to speed dancing lindy hop in no time! This class assumes no previous dance background and welcomes absolute beginners. Compared to our 9PM East Coast Swing Lesson, this class will take a deeper dive into leading and following technique and classic Lindy Hop form and patterns. Cost: $30 early registration online by July 2. $35 full price online and at the door. $25 when enrolling in multiple classes. Price includes 9PM Beginning East Coast Swing Lesson & dance admission on July 4th. Save your spot in class! Originally from Ohio, Joy got hooked on the improvisational energy and partnered creativity of swing dancing while living in Boston. She loves to both lead and follow, and has dabbled in almost all of the swing dances, with an emphasis on Lindy Hop, Balboa, St. Louis Shag, Collegiate Shag, and Charleston. She has been teaching swing dancing since 2014, and has won national and international competitions in Balboa, St. Louis Shag, and Collegiate Shag. In class, Joy exudes energy and positivity, with a focus on partner connection, mutual responsiveness, and helping all dancers grow. Her style emphasizes fun, creativity, musicality, and technique. Nathan specializes in Lindy Hop, the high-energy swing dance from the 1930s and 40s, and has been teaching, performing and DJing since 2005. He started swing dancing in 1997 and lindy hopping in 2000. A regular dancer in San Francisco since 2001, Nathan enjoys the creativity and personal connection of social dancing as well as the challenge and satisfaction on working on and improving his dance. He has taught at practically all of the local swing dance venues at one time or another, including the 9:20 Special, Lindy in the Park, Tuesday Night Jump, Rent Party and original Doghouse, and has been a featured instructor at regional workshops such as Swingin' at the Savoy, California Swingin', *Workshop (San Luis Obispo), Santa Swing (Santa Barbara), and Le Hot Sauce (SF). Curious about Balboa? Come learn the basics of this dance and join the movement! Balboa is a swing dance style that originated in southern California on the Balboa Peninsula and became popular in the 1930s and 1940s. It is characterized by its closed position and body lead. Its simple and efficient basic step makes it well-suited for dancing to extremely fast music, including songs over 300 beats per minute. Balboa also has a unique focus on flash footwork, which is a great way to add footwork and rhythmic precision to your dancing as well. Modern Balboa also includes a style known as Bal-Swing. This style allows for more room between partners and typically incorporates movements from Charleston and Lindy Hop. Geared toward Intermediate dancers, but all welcome! 3+ months of Intermediate Lindy Hop classes & regular social dancing recommended. Tor Helmer starting dancing ballet at a young age and absolutely fell in love with swing dancing a few years ago. He believes that dance is about movement and expression and learning to interpret the song with how you feel it. Best achieved with a strong foundation in the basics and underlying movement. His dream is to promote Balboa as the wonderful and intimate dance it is and to show everyone it’s merits at both throwing down and pure dance enjoyment! All class costs include admission to the Cat’s Corner Swing Dance Party. Stay to dance to live swing music starting at 9:30pm. The venue features cocktail bar, roomy dance floor, and great swinging ambiance. We often have surprises around 10:30pm – it could be a special performance, contest, or silly group activity — to add to the festivities.